Even though I've been on this transitioner journey for well over a year and a half now, I have yet to find a staple DC that I know will pack a punch and deliver on its promises. 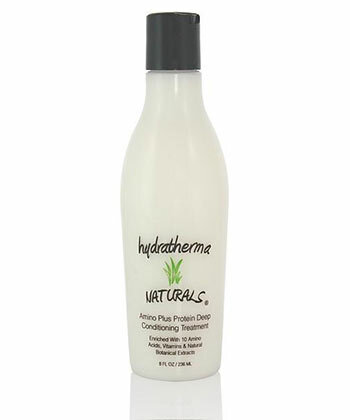 And I won't lie to you, when Hydratherma Naturals Amino Plus Protein Deep Conditioning Treatment arrived at my doorstep in an unassuming black and white bottle, I didn't think much of it. That is, until I used it and it changed my life. I finally have a staple protein deep conditioner. Let me share with you why it made it to my list of the Top 10 Deep Conditioners for Transitioning Hair. With just one use, you will see and feel a difference. This treatment contains an exceptional and unique complex of 10 structurizing proteins, all of different molecular weights. These proteins penetrate deep within the hair shaft producing benefits like no single protein can. Contains vitamins and botanical extracts to strengthen the hair and prevent breakage. Also provides sun filter (UV protection). Paraben free. pH balanced. I almost did a praise dance in the shower after using this stuff. Do you see that SHINE? Let me be the first to tell you that the product has an amazing slip, provides super softness (which is a feat for a protein conditioner), and just made my hair feel super buttery and smooth. Even the heat damage. 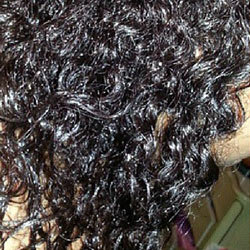 In fact, just by touch alone, I could not tell where my natural hair ended and my heat damage began. Normally conditioners make my natural hair feel great, and my heat damage feel ok. But not this DC!!! My hair's elasticity and strength was instantly improved. They said I would see and feel a difference after just one use -- and I did. New staple, hands down. Cetyl & Stearyl Alcohol: Considered "fatty alchols" -- NOT to be confused with drying alcohols such as ethyl. Both Stearyl and cetyl alcohol are lubricants, thickeners, and emollients. They give conditioner its velvety feel without making hair greasy. Also used to keep product ingredients from separating. Dicetyldimonium Chloride: Cationic (positively charged) surfactant that helps correct the slightly negative charge of hair and closes cuticles to prevent damage, chipping, and weakening of hair. Dimethicone: Silicone-based polymer used as a lubricating and conditioning agent. Tocopherol Acetate: Vitamin E. Supports hair growth, and believed to assist in preventing hair loss. Also has been known to be a proven UV protectant. Glycerin: Vegetable-based humectant that absorbs moisture from the air. This product and others from Hydratherma Naturals is available in select stores across the country, mainly in the midwest, south, and on the east coast. There is also some international availability. Unfortunately, the only place in Cali I can find this stuff is in San Leandro, 361 miles away. Looks like I will be purchasing online at www.hydrathermanaturals.com. To find out if there is a retailer near you, click here. The 8oz bottle runs for $16.99. Under normal circumstances, I would consider this expensive. To be honest about it, it is...but still not as expensive as some other deep conditioners I've seen, like Miss Jessie's or Carol's Daughter. Because it is a protein conditioner, I would not consider it a product for weekly use (maybe monthly), which can ease some of the expense. I feel like I showed up late to the protein/moisture and pH balance party that most naturals rave about. With the exception of a failed apHogee experiment or two, I usually rely on henna and ApHogee Keratin & Green Tea Restructurizer Spray to strengthen my hair. And for the most part they've worked quite well. But I always felt like my hair was missing something. Like it was good, but not great. I used to think pH balanced was a fluff, but now I'm beginning to see how the right pH can take your hair to the next level. And the Amino Plus Protein Deep Conditioning Treatment has definitely done that. I'm not a huge fan of the fragrance. It's slightly sweet and synthetic-smelling, but definitely nowhere in the ballpark of being a deal breaker. It doesn't bother my allergies, isn't overbearing, and doesn't linger in the hair. If you noticed, none of the proteins or aminos were listed in the top 6 ingredients after water. I don't particularly see this as a drawback, although some looking for a stronger treatment might. As far as I'm concerned, the higher up on the list the proteins, the higher the concentration, the harder and more straw-like your hair will become. The proteins and aminos in this DC sit squarely in the middle of the ingredient list, making it (in my opinion) ideal for most hair types to benefit without being overpowering. This product is awesome for so many reasons. It delivers on it's promises, does not contain mineral oil, petrolatum, or parabens. It is pH balanced, which I am beginning to understand is kind of a big deal (haha). Lastly, it is an amazing high quality product created by a small business owner, Saleemah Cartwright. I love, love, LOVE this deep conditioning treatment. If you're looking for a great product to provide an amazing protein, moisture, and pH balance to set your hair RIGHT, look no further. Seriously.